Aircraft Maintenance course in India is one of the most highly paid profession. Aircraft Maintenance course can be done through DGCA, Govt of India approved Institutes. This is licensed based course and the license is valid in private and government sector in overseas. The duration of Aircraft Maintenance is 4 years which includes 2 year academic programme and 2 years practical in flying environment. 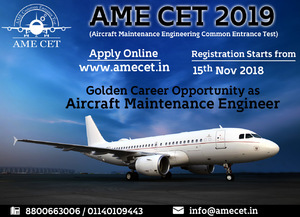 For more detail visit our official website www.amecet.in or contact us 8800663006.